Everyone enjoys a little retail therapy once in a while, but for some it is a more rewarding experience than others. 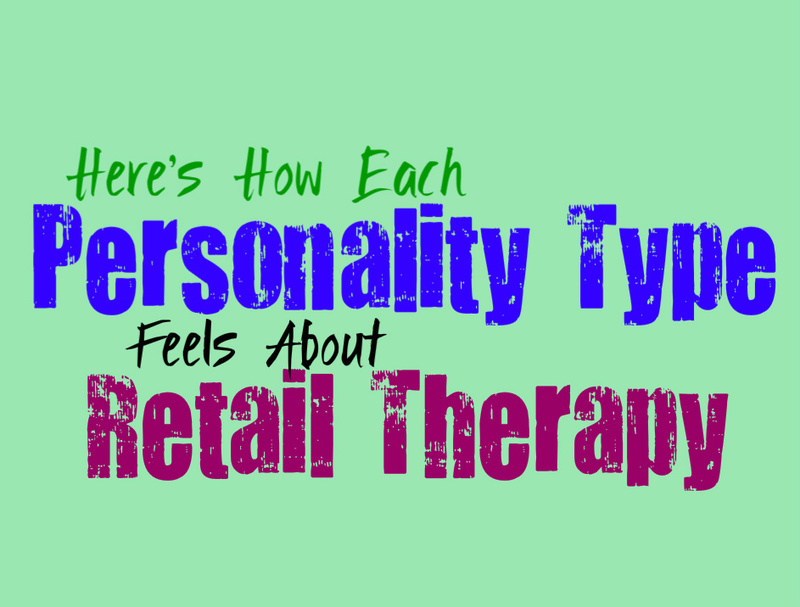 Here is how each personality type feels about retail therapy. INFJs are not shallow people and they rarely care much about physical objects. While INFJs are not caught up in material things and consumerism most of the time, they do have moments where they enjoy it as a distraction. INFJs who are under high levels of stress might enjoy spending some of their hard earned dollars on things that they enjoy. They might enjoy purchasing some movies, video games or simply something aesthetically pleasing. While INFJs are not shallow people, they do have times where retail therapy can help them relieve some stress. ENFJs definitely enjoy some retail therapy when they are under a lot of stress. While ENFJs are not shallow people, it is necessary for them to treat themselves to something nice once in a while. They are always tending to the needs of others and go above and beyond to make people happy. When the ENFJ is feeling unappreciated and stressed, they sometimes enjoy spending a little money on themselves in order to pick up their unhappy mood. INFPs aren’t usually materialistic people, and might benefit all that much from retail therapy. When the INFP is feeling down they need something much more substantial to lift them back up again. The INFP needs to spend time the things they are passionate about, in order to ignite a spark in their soul once again. While they might indulge in some retail therapy, it often doesn’t help them feel better for very long. INFPs really crave something deeper than just spending money, and need to find something that makes them feel like themselves once again. ENFPs do enjoy being able to have nice things, and might look into making a few purchases to life their mood. When the ENFP is stressed or stagnant, they need to experience something exciting and new. Sometimes spending money on a new hobby or activity can really help the ENFP feel excited once again. They aren’t shallow people, they simply enjoy being able to experience new things in life. ENFPs can certainly be drawn to aesthetics and might enjoy treating themselves once in a while. It is best when they purchase things they can actively enjoy though, like a video game or something that requires their skills to enjoy. INTJs are not completely uninterested in physical objects, and do sometimes enjoy spending money on new gadgets. For INTJs it is about experiencing something new and being able to learn more about it. They aren’t often hung up on having the latest fashions and trends, they simply purchase what they like. INTJs want to be able to work hard in order to acquire the things they like, so they do enjoy being able to have nice things. INTJs simply don’t find themselves feeling replenished by purchasing objects, and rarely gain much from retail therapy. ENTJs do enjoy being able to have nice things, and don’t want to feel like they cannot spend their hard earned money. For ENTJs it is often a sign of success when they are capable of purchasing the items they want without worry. They are proud of their gadgets and nice items, but they value much more important things in life. For ENTJs retail therapy can only do some much to bring up their mood, and they will require much more substantial experiences to do so. INTPs can often find themselves trying to utilize retail therapy to lift their current mood, but this only lasts for so long. They can sometimes jump to buying new gadgets and things they like, in hopes of distracting themselves. They will enjoy being able to spend money on things that can actively utilize tier skills and abilities. They will especially enjoy being able to explore a new hobby or trend, and find ways to learn from them. This doesn’t work long term for INTPs, since they likely need to look into what is actually causing them to feel stagnant. ENTPs sometimes enjoy a little retail therapy, but only when they are experiencing something new from it. Simply going to the same boring stores, looking at the same type of items, is not going to stimulate the ENTP. They need to spend time purchasing items that get them excited, or make them want to dive into something new. For them retail therapy is only beneficial if it helps them look towards the future and possible new experiences they might have. ENTPs dislike being stagnant, and often utilize retail therapy as a way to pull them out of a stagnant place. ISTJs aren’t really enriched by retail therapy, and might find themselves bored by it. They will enjoy it if they can find items that can keep their minds distracted. Something like a video game or a great book that they can dive into, can actually make the ISTJ feel better. For them it isn’t as rewarding to purchase items recklessly, and only enjoy this if they know it is completely affordable. They are frugal people and can become more stressed by the idea of spending money in an emotional way. ESTJs aren’t much for retail therapy, and might find it a bit annoying. They aren’t ones to spend a lot of money recklessly, and often feel better when they can save their cash. ESTJs would rather watch their bank account build, and will experience more joy from being frugal most of the time. ESTJs feel better about retail therapy, when it is a loved one purchasing items for them. Having someone who cares enough to buy them nice things can really make the ESTJ feel better. ISFJs definitely enjoy a little retail therapy when they are feeling underappreciated. There are times when the ISFJ simply needs to consider themselves and their own needs. They rarely take time to enjoy their own hobbies and sometimes they really need this. For ISFJs retail therapy can be about buying new items for their home, or a new outfit to make them feel fresh. ISFJs might not enjoy this as a long term solution, but in the moment it can be a nice way to unwind. ESFJs often enjoy retail therapy as a way to treat themselves when they have been overwhelmed. They might enjoy being able to purchase a new item, especially if it is something they can share with their loved ones. For ESFJs it isn’t about the shallow aspects, it is simply about doing something for themselves. They rarely focus on their own needs, and once in a while it is important to find something that they can enjoy. ISTPs are not usually fulfilled through retail therapy, and need something more substantial. For ISTPs seeking out new experiences and thrills is what will really benefit them. They need to feel free to explore something new and exciting, and want to be able to challenge themselves. They might enjoy retail therapy if it helps them explore a new hobby or activity tough. ESTPs definitely enjoy retail therapy as a means of lifting up their current mood. This doesn’t seem to last for them long term, and can leave them feeling worse afterwards. ESTPs can be a bit reckless, even when it comes to their finances. When they have had a really rough day the ESTPs will enjoy spending their money on items that make them feel better in that moment. It might become stressful later on though, when the ESTP realizes how much they have spent. ISFPs are drawn to things they find beautiful and do enjoy a little retail therapy. ISFPs might not be the type to like the most expensive item, but they do find themselves drawn to physical things. They are often caught up in the present moment, which can lead to them spending some money in order to lift up their mood when they are feeling down. ISFPs are not shallow people, so long term they will need something else to help lift their mood.